Some genius at Whirlpool figured out how to save $0.12/dryer by using the infamous half-moon slider idler. 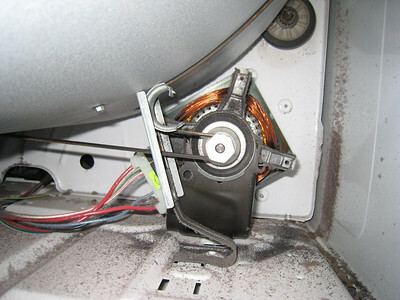 The belt slides across the teflon strip causing accelerated belt wear and much more frequent belt replacements. The extra strain on the motor has caused premature motor failures, too. Good for me because I fix ’em for a living; bad for you because you’re paying for it! Note the black fuzz below and beside the motor. That’s from the belt. Yep, that’s all there is to it. No roller, just a teflon strip. The belt rubbing across this teflon strip can make weird noises, too. That’s what prompted the customer to call me in the first place. Here, I replaced the slider with the old-style roller idler pulley. Whirlpool has since discontinued the slider style because of all the premature belt failures out in the field. Experience is the price of wisdom. Can I hear an "Amen?" How Does that Dryer Belt Go On? 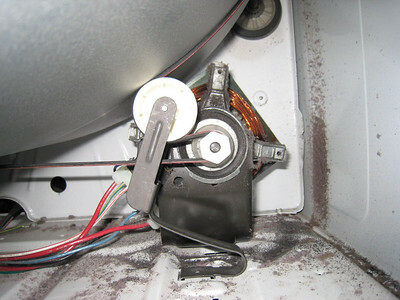 This entry was posted in Dryer Repair on May 8, 2009 by Samurai Appliance Repair Man. 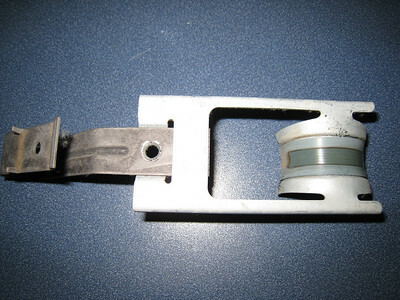 Thank you for your great post on the Kenmore tension slider/idler pulley repair. My dryer is now up and running because of your great pictures and commentary. Whole repair(belt & pulley) cost $29 less the 36 cents I found!